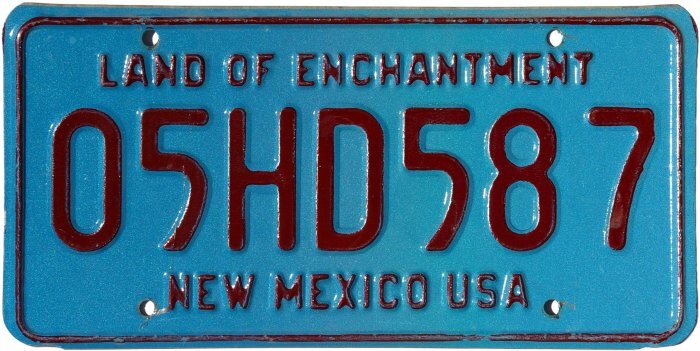 Prior to mid-1923 New Mexico State Highway Department vehicles received regular “civilian” license plates, but from then on its vehicles were given their own unique plates. Those from mid-1923 through 1933 were manufactured by private companies and varied widely in appearance from one year to the next. 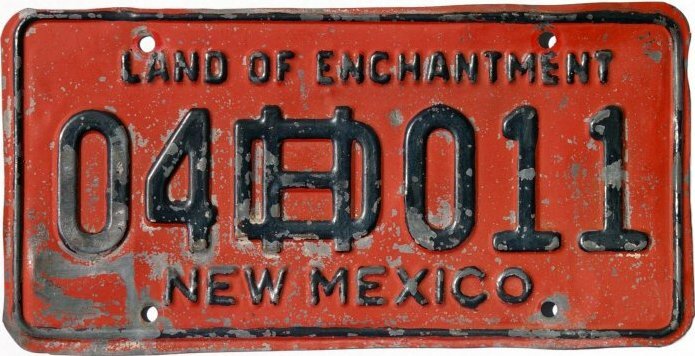 Beginning in 1934, concurrent with license plate production being taken over by the New Mexico State Penitentiary, a special over-stamped HD monogram was added. The monogram was switched HC (for Highway Commission) for a very short time in 1960s before being dropped altogether. Further changes in the appearance of the plates occurred upon changes in its name, first to Highway and Transportation Department, then to Department of Transportation. 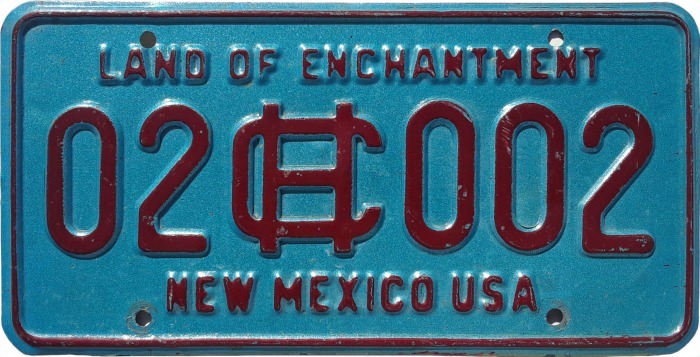 The New Mexico DOT now uses generic State Government plates like all other state agencies. 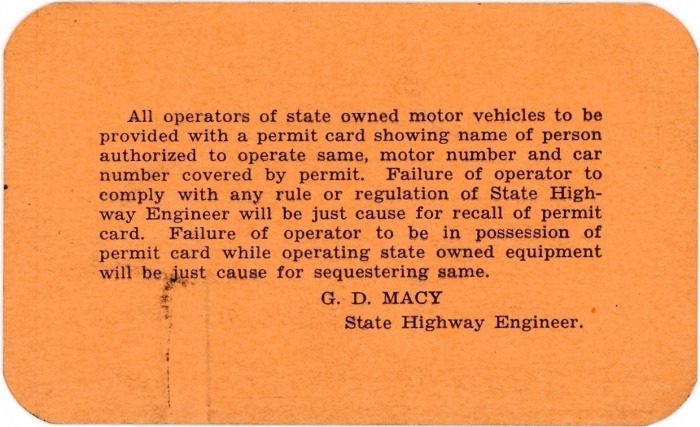 Note: In 1929 and 1930 Highway Department vehicles used the same Official plates as all other state-owned vehicles, rather than their own unique plates. There are other (later) years for which Highway Department plates are not known to exist, and it may be that Official plates were used in those years, too. The 1936 plate is by far the earliest HD trailer plate known. When found, it had at least three coats of foreign paint on the front, including grey, blue and yellow. The back, however, had not been painted, and still has most of its orginal white paint. A prior owner bead blasted the front, but fortunately left the back untouched. The plate is undated, but for plates with these dies the white background paint was used only in 1936 and 1942. The two can be differentiated by the fact that the central zia on 1936 plates was 1½" in diameter, while that on the 1942 was noticeably smaller at 1-3/16". This plate, therefore, is positively identified as a 1936. Restoration of the front of the plate is pending. 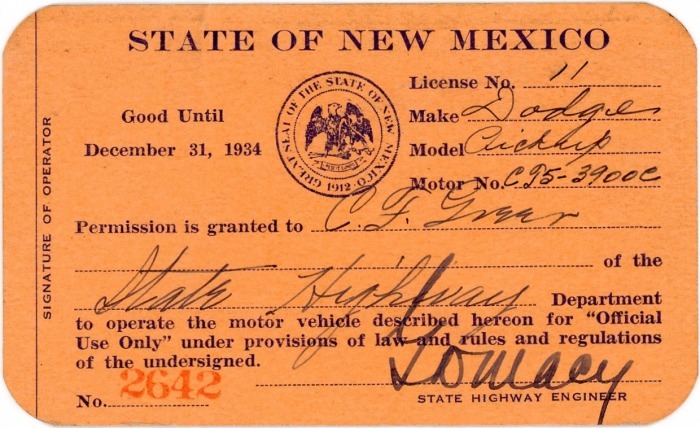 New Mexico State Highway Department motor vehicle operator permit cards, 1934. These 2½" x 4⅛" cards are not driver’s licenses, per se, but show that the bearer was authorized to use the vehicle identified on the front of the card. 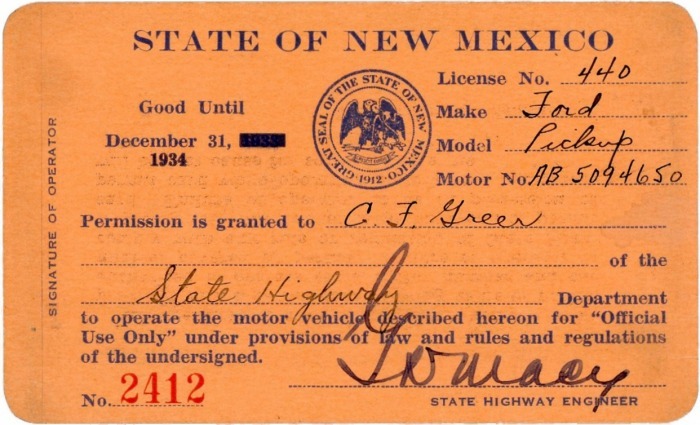 (New Mexico did not require driver’s licenses until January 1, 1938.) 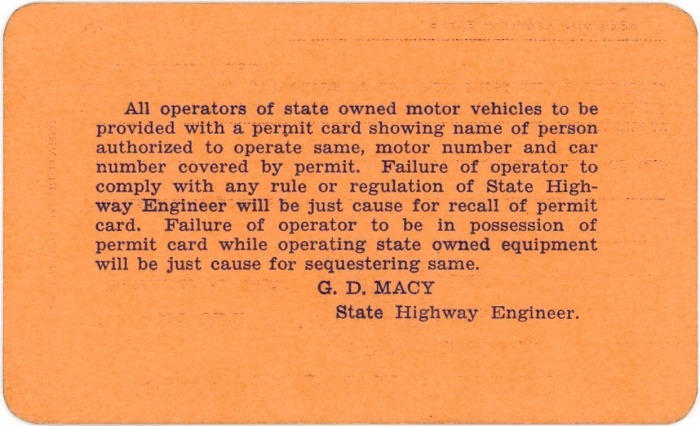 The fact that there is a blank space where the specific department’s name is entered, indicates that these cards were likely used for all state-owned vehicles, not just the Highway Department. Photo credits: Highway Commission #02HC002 courtesy of Mike Wade. All others by Bill Johnston.